The Kirby Kangaroo Kids Club is a savings program at Citizens Community Credit Union for kids ages 0-12, and is designed to help educate children about the value of money and good saving habits in their early years. It’s easy to join — all it takes is a $25 deposit to open the savings account and a parent or guardian to be a joint owner of the account. A Kirby Kids Club account is different from a regular savings account but earns the same dividend as a regular savings account. 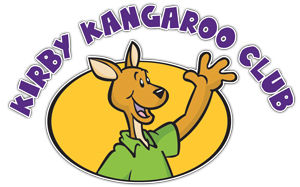 As a Kirby member, kids will receive a membership card and a Kirby Kangaroo Club Passbook. They receive a sticker for each deposit, and sticker cards can be redeemed for fun prizes. In addition, they will receive a birthday card from Kirby Kangaroo, invitations to club events and parties and more! Why a Kirby Kids Club Account? How can you help your kids build confidence in their financial future? One good answer is a Kirby Kangaroo Club savings account! A regular savings program helps children understand the basics of personal finance and demonstrates the power of savings to help kids reach their goals. Even very young children can grasp the fundamentals of saving, and become excited about having their very own savings program. As they grow and acquire allowances, after-school jobs and other income sources, children can see those savings add up — and their pride and independence grow, too. Stop into your closest Citizens Community Credit Union location, and join the fun today!